Cyber attacks have become a normal occurrence for organizations. Attackers are better organized, more skilled and more varied — they not only want to steal data but also to simply disrupt your business for profit or other reasons. As the monetary damage from these attacks grows, strengthening your IT security architecture is increasingly important for the company’s bottom line. 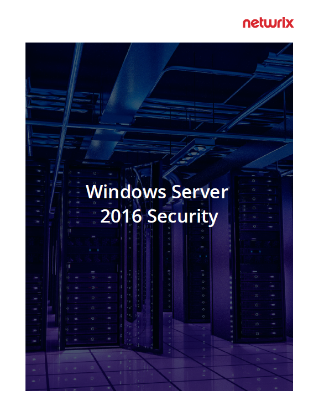 This eBook details key features of Windows Server 2016 that can help IT professionals enhance the security of their IT environments. It explains ways to ensure proper protection and management of administrative credentials, features that can enhance your least-privilege model, tools that will help you mitigate the risk from malware, architectures that will secure your virtualized environment, techniques that will improve your network security and more. How can I protect the credentials of our privileged accounts? How can I improve our privileged access management process? How can I mitigate the risk of malware and other threats? How can I audit my Windows Server environment?